In 1861, as the Civil War broke out across the nation, General Sibley, a confederate from Texas, signed up with Jefferson Davis in a plan to overtake New Mexico, Colorado and eventually California. The New Mexico Territory braced for a series of battles and sent requests to Colorado for support. Men signed up for war, and the women of Denver responded as well. In August 1861, the Ladies of Denver presented a hand-stitched 34-star flag to the recently formed First Colorado Infantry, Company D. The flag and its bearer advanced to New Mexico and a date with infamy in Glorieta Pass. Meredith Davidson, curator of 19th– and 20th-century Southwest collections, recently traveled with Registrar Deborah King to History Colorado, which now holds the battle-scarred flag. Thanks to a generous loan, they brought it back to New Mexico, where it will become a cornerstone piece for the Mezzanine Gallery exhibit, Fading Memories: Echoes of the Civil War, opening May 1. The exhibit gives the museum a chance to partner with the Santa Fe Opera, which debuts Cold Mountain this August. 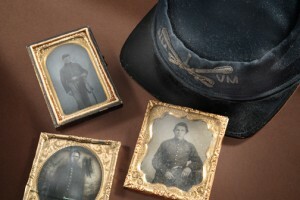 To pull it off, Davidson joined Palace Press Director Tom Leech and Photo Curator Daniel Kosharek to present various types of artifacts that represent the opera’s story of loss, relationships and memory, all within the context of the Civil War. The flag will share space with cased images, postwar lithographs, journals, weapons and a cross worn by a soldier at the decisive battle in Glorieta. The flag was brought back to Colorado by Michael Ivory, one of the unit’s color-bearers. In the 1960s, it was donated to History Colorado. The condition of the flag when it was donated to History Colorado led to an initial conservation effort in 1963. Another effort in 1994 noted the flag’s condition had worsened. One area of the description suggests it was, “extremely tattered in some places and generally structurally weak in the star field. Almost 50 percent of that field is lost and shows tattering, tears and detached sections.” The flag may have survived battle, but in the years since its wool stripes and stars were slowly ripping apart,” Davidson said. “Our request to borrow it led to History Colorado undertaking a new conservation effort, this time with more stabilizing, cleaning, and stitching to enable the piece’s long-term display. Perhaps in error or with the intention to present the flag vertically, the flag was stitched down to a backing with the canton (the part with the stars) on the right. That 1963 choice sealed the fate of the flag for future presentations. Because so much of the blue fabric was lost, the 2014 curators and conservators chose to leave it in place and created a sheer overlay within the canton for extra support. Since February, Friday afternoons have been enlivened by the weekly presence of young girls interested in learning more about the technical aspects of the Poetics of Light exhibit and the imagery in the Painting the Divine exhibit. Museum educators paired with Santa Fe’s Girls Inc. program to devise a new after-school program set to be repeated this month. In a series of visits with girls of different ages, the educators took them into the exhibits and then to the classroom, engaging them with hands-on projects. The 11- and 12-year-old girls made heliographs using photosensitive fabric paints, while the 9- and 10-year-old group made cyanotypes. Eight year olds made camera obscura tubes and the really, really young ones learned about light-and-dark by crafting silhouettes. “Everyone toured the Poetics of Light exhibition and got really excited about photography,” said Educator Melanie LaBorwit. Participation varied from nine to 15 girls per week—a total that could grow as the program moves forward. The Girls Inc. organization is dedicated to offering programs for girls that inspire them to be smart, strong and bold. Who knew an expanse of stained and rumpled bricks could evoke history. Or that smoothing out their rumples would require such careful work. 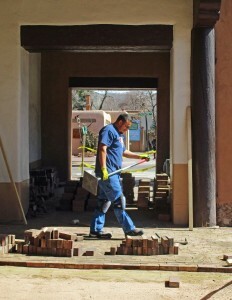 Steve Baca and Henry Trujillo (pictured, at left) of the History Museum’s facilities staff are learning that and more as they improve the Palace Portal’s brick walkway. That’s critically important for an adobe building that was recently named a National Treasure. Should the Palace’s adobe walls wick up standing water, they could suffer grievous damage. But the bricks are considered historic, so the fix required careful work. Baca and Trujillo block off a section at a time, pull up the bricks, and clean each one. They add new sand, level it, then replace the bricks. Not enough bricks are worth replacing, so the museum negotiated replacements from a stash that once bedecked city streets—and are keeping their eyes open for other possibilities. As for what’s fun about that hard work? “Nothing,” he said, laughing. Music, dancing and learning about history blended on March 27 inside the Telling New Mexico exhibit. 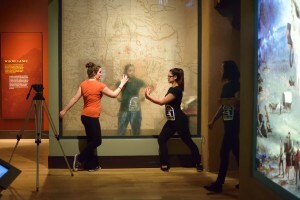 The History Museum and New Mexico School for the Arts Dance Department developed “The Borders Project Workshop” as part of the museum’s Routes and Roots program. René Harris collaborated with Adam McKinney, Dance Department chair, and teachers Micaela Gardner and Sarah Ashkin, to devise a means for turning thought into action. Students exploredquestions related to the themes of immigration and the movement of peoples, then used movement and dance to help process that information. The school’s 9th–12th grade students started in the museum classroom to ponder what it means to be a New Mexican, how boundaries or borders are created, and who draws the lines. They then moved into the exhibit to create dance steps in response to prompts related to borders, immigration, identity and homeland in four areas of the gallery. They reconvened in the classroom to discuss how “dancing the exhibit” helped the illuminate the questions that were posed and showed their respective compositions. A short video will be produced to document the experience. Routes and Roots was developed as part of a series of National Dialogues on Immigration affiliated with the International Coalition of Sites of Conscience, which funded this program. The coalition is a worldwide network of museums, historic sites and initiatives commemorating struggles for justice of human rights.